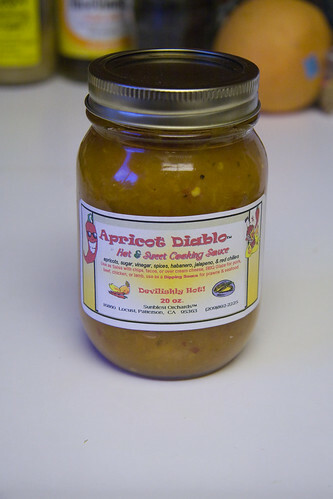 We had just visited the Sunblest Orchards booth, where we picked up a jar of Apricot Diablo glaze—a tasty looking mixture of apricots with habaÃ±ero and jalapeÃ±o peppers and other spices. 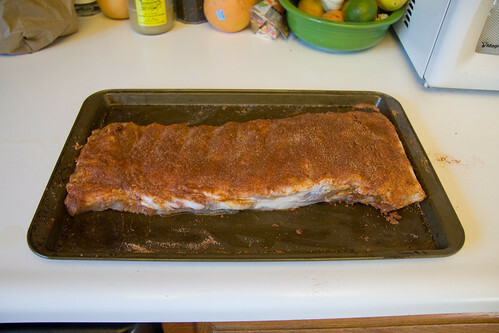 One of the recommended uses was pork ribs, so we checked with Bledsoe Meats and scored their last rack of spare ribs. Ribs, both beef and pork, have long been favorites of mine, but—an odd experiment with kangaroo aside— I’ve never attempted straight up BBQ ribs. 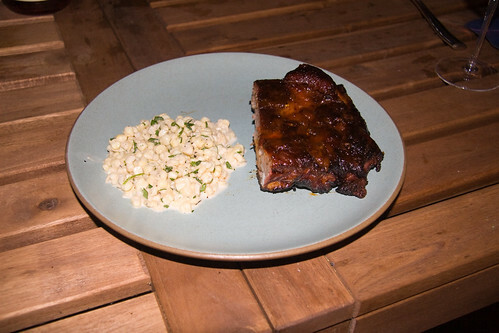 For guidance I turned to Steven Raichlen’s How To Grill and followed his very detailed instructions for preparing pork spare ribs. I’d encourage anyone interested in grilling a wide variety of foods to pick up this book, as he covers all sorts of foods with many discussions of technique and excellent photographs demonstrating key steps. If I gloss over any of my prep steps, it’s only because I’m trying to exactly follow his lead, and you’d do better to go directly to the master than to work from my imperfect first attempt. 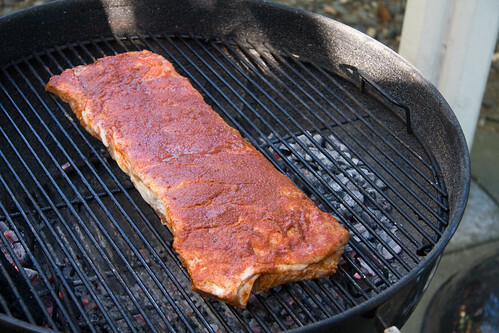 To begin, I trimmed the cap and rib tips from the rib rack. I also did my best to remove the membrane from the back of the ribs. 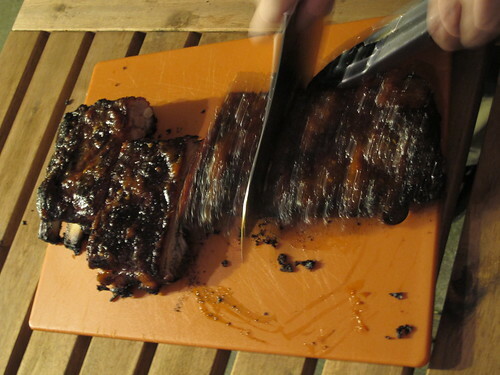 When we ate the ribs, I discovered that I did not perfectly follow the line of the rib tips, and cut through a couple of them, leaving them on the rack. This isn’t really a problem, but as a matter of technique, it was suboptimal. In the future, I’m going to take a little more time with that step to get it down pat. I kept the rib tips and the cap and cooked them up the next day Vietnamese style. 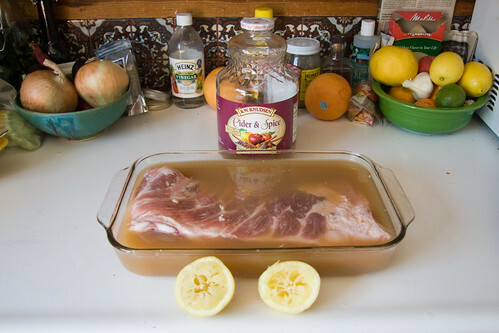 Following Raichlen’s advice, I submerge the ribs in apple cider and the juice of one lemon, covered them, and put them in the fridge for about five hours. When the ribs were done marinading I patted them dry, then covered them with a spice rub of salt, garlic salt, paprika, cumin and cayenne. 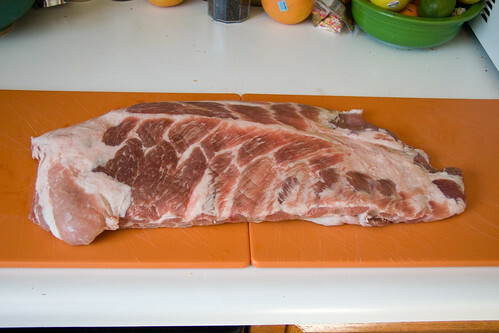 In the future, I would omit the salt from this, as the ribs came out saltier than I wanted. In general, I’ve discovered that I tend to underestimate the power of salt in my rubs. I’m working on it and the first step is acknowledging I have a problem. The ribs went back in the fridge, covered, for close to three hours. 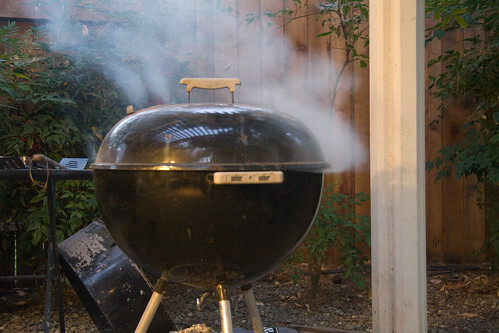 When it came time to cook, I fired up the Weber with mesquite charcoal arranged for indirect cooking. I placed the ribs in the center of the grill, with the coals to either side, then threw a handful of soaked and drained pecan wood chips onto each charcoal pile. Pecan is one of my favorite cooking and smoking woods. I find that it is similar to applewood, but a little stronger. It shines in a 50/50 split with oak when we make our famous Thanksgiving turkey, and works well to add a sweet smokiness alongside any charcoal you prefer, or on its own if used in larger chunks. 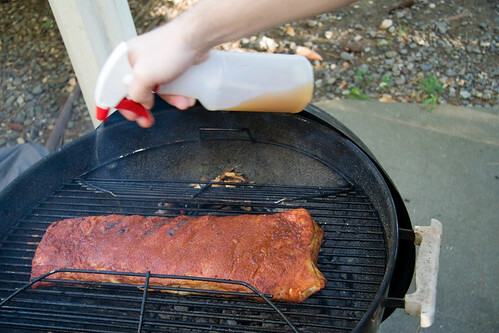 Following Raichlen’s advice, I sprayed the ribs with more cider every 20 minutes. I also added a little extra mesquite and pecan every hour to keep the heat and smoke going. 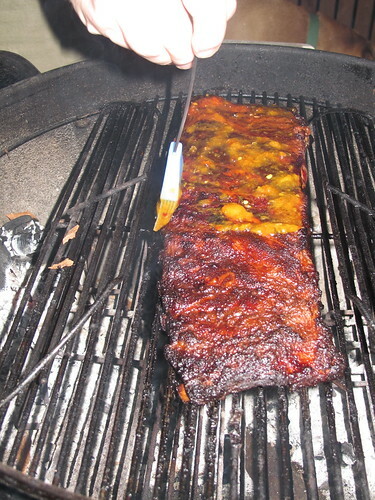 As we reached the final 30 minutes of cooking, I covered the top of the ribs with a generous layer of the apricot glaze, kicked the smoke up a notch and closed the vents to let things get nice and smokey. 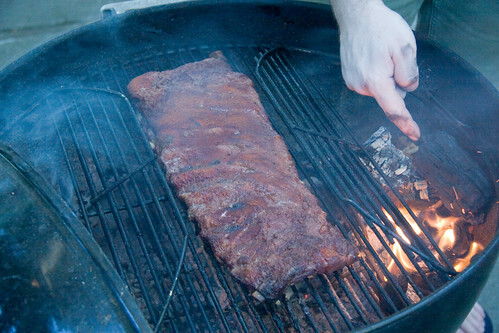 We set the table, basking in the evening heat and watched generous billows of pecan smoke escape the grill. 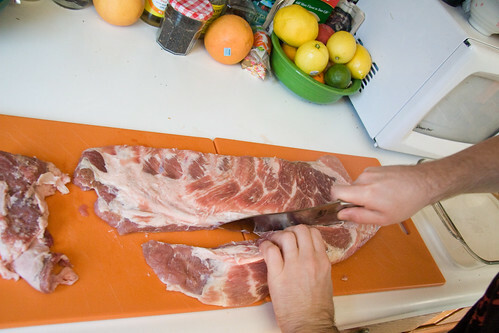 After nearly three hours cooking, I pulled the ribs and sliced them into five manageable pieces. We served them with some homemade corn slaw. Jen happily gobbled up her first set, and reached for seconds. Success! Photos can be found here and here.